Simon & Schuster, 9781501107979, 400pp. 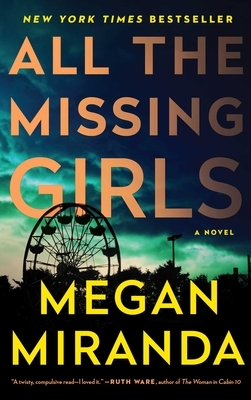 "In All the Missing Girls Megan Miranda leads readers back through the past of a small southern town, enfolding them in a slow, tense nightmare of suspicion, menace, and tangled motives. A twisty, compulsive read--I loved it." "Fiendishly plotted...Miranda convincingly conjures a haunted setting that serves as a character in its own right, but what really makes this roller-coaster so memorable is her inspired use of reverse chronology, so that each chapter steps further back in time, dramatically shifting the reader's perspective." "As original as it is addictive, this story puts a knot in your gut from the opening pages. Then, through the wizardry of its unconventional structure, that knot tightens and tightens and will not let go until the final pages—and even then the story continues to haunt you. Vividly rendered, psychologically complex, and narratively acrobatic, All The Missing Girls is, above all, totally gripping." "Darkly nostalgic....Miranda takes a risk by telling the story backward, but it pays off with an undroppable thriller, plenty of romantic suspense, and a fresh take on the decades-old teenage-murder theme." "All the Missing Girls is a smart, suspenseful, and emotionally complex thriller. Told in reverse, this story will make you want to lock the doors, turn off the phone, and read until the last satisfying page." "Megan Miranda’s utterly gripping and original All the Missing Girls keeps you off balance in the most perfect way. I was held hostage by the book from the first page to the stunning conclusion. This literally backward tale is a winner."